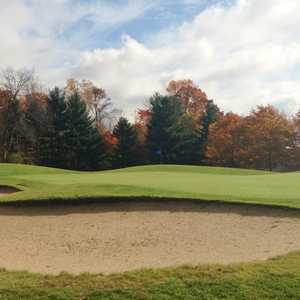 GRASS LAKE, MI - When I spoke with Ann Arbor-based golf course architect Bill Newcomb earlier this year, our conversation turned toward one of his recently completed projects: Calderone Farms Golf Club in Grass Lake. But Newcomb assured me that the layout, which measures just over 7,000 yards from the tips, consists of varied topography, and offers more than a few surprises as it meanders over the former farm acreage - more than are visible from nearby I-94. So eager was I to experience the new southern Michigan course that not even scattered thunderstorms could make me cancel my round. So after saying a small prayer and removing as much metal from my golf bag as possible, I headed out to Calderone Farms. And although the challenging, distinctive design did not disappoint - and the gusting winds, intermittent downpours, and flashing skies left me and my golf ball relatively unscathed - spotty course conditioning and service no sunnier than the weather did nothing to chase away the dark clouds. 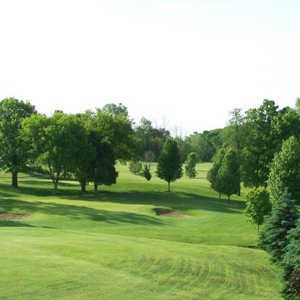 From I-94, wistful golfers motoring by on their way to stifling offices can glimpse the back nine of Calderone Farms. The visible holes stretch languidly over the rolling former farmland, eventually disappearing over a ridge somewhere behind the Michigan White Tail Deer Museum. The bent grass fairways coil around hillocks and mounds thick with timothy grass and alfalfa, conjuring images of the links courses of British Isles. As I pulled into the parking lot, I was greeted by a converted mobile home, adequately serving as the pro shop, clubhouse, and grill. Unfortunately, the greeting pretty much stopped there. To be fair, Head Pro Jerry Pasco and his small staff were planning a Ford Motor Company outing for later in the day, and maybe they were stressing over the weather. But quite frankly, no one seemed too concerned that there were other players braving the elements that morning. When I asked Pasco for some advice on playing the course, he simply warned, "You can't hit the ball crooked out here, I can tell you that." Fair enough. What about the turf? OK. Any future plans for development? "We have another 484 acres. The plan is to add one or two more courses. But who knows when that will happen." Ah, now we're getting somewhere! What are the rates? All righty, then. I guess I'll head out. Can I start on the tenth to avoid getting behind the only other three groups on the course? Do I need a cart key? (Hands me one.) Right. Nice chatting with you. Being the only golfer on a course is exhilarating. Being the only person on the exposed, hilly back nine of Calderone Farms while thunder rumbles all around…well, that's exhilarating too, but in a life-threatening sort of way. After teeing it up on the par-5, 540-yard tenth, I thought it very odd that my mediocre first drive had ended up so close to the green. With no clue as to the yardage - a recurrent theme, it turned out - I hit a decent 5-wood into the wind to within (I guessed) 70 yards. As the rain started to come down, and my glasses streamed with water, I hit a sand wedge close to the pin. But as I reached my ball, I found the marble 100-yard marker between my ball and the hole. Lightning flickered above me, adding to my disorientation, so I picked up and scooted back to the clubhouse, even though no horn had sounded (another recurrent theme). Inside, I found Pasco to ask about that confusing tenth. "Yeah, that's a temporary green," he chuckled, not really looking up from his computer. During a 20-minute pause, the staff all said they thought the rain was supposed to blow over by the afternoon. But no one seemed particularly concerned whether the golfers seeking shelter in the clubhouse returned to the course or stayed put, or left all together. Eventually, I decided to forgo the pleasure of putting on the fairway - or "temporary green" - of the tenth, and headed to the tee of the brawny 232-yard, uphill par-3 eleventh. The temporary green on the tenth notwithstanding, the entire linksy back nine is a real joy to play. The elevated tees, knee-high rough, undulating fairways, and hidden fairway bunkers do, as billed, place a premium on straight, long tee shots, especially from the championship tees (just over 7,000 yards). The 457-yard 13th is a monstrous par 4, especially into a vicious south wind. Your tee ball has to be long enough to reach the corner of the left-to-right dogleg. But if you hit into any of the half-dozen pot bunkers in that vicinity, you can forget par and start hoping for bogey. The greens on this linksy nine are characteristically deep and narrow, and drain remarkably well. Despite the rain, they were lightning-quick. And speaking of lighting, another spate of the dreaded stuff drove me back to the clubhouse immediately upon finishing the superb 18th (423 yards, par 4). I didn't even have time to photograph the water hazard to the left and delicate bunkers dotting the left side of the two-tiered, elevated green. Once again, however, no alarm sounded, and no staff offered input as to whether conditions were safe to return to play. After another brief prayer, I headed back out to tackle the front nine, which winds its way along the edge of the forested Waterloo Recreation Center. On this nine, golfers find themselves negotiating even more hills and valleys. In fact, both front and back nine contain more than 200 feet of total elevation changes. The woodsy front seems more severe, though, because of the way the trees appear to constrict the fairways. One serious problem for this first-time visitor was a distinct lack of yardage markers. 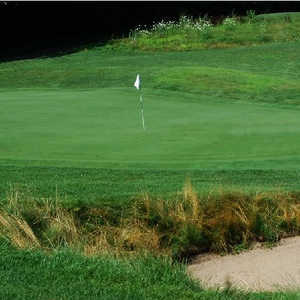 The cart paths end right after the teeing stations, and begin at the greens, which means no markers on the cart paths. Sprinkler heads seemed few and far between, and the marble markers every fifty yards were usually hidden behind the wrinkles in the undulating fairways. As a result, I was constantly guessing at yardages, which is no mean feat when you're dealing with occluded greens, blind hazards, and blind landing areas. I mis-clubbed myself time and time again. If I had been a caddy, I would have fired myself. More visible markers and/or yardage books are badly needed. To make matters worse, conditions that were acceptable but not terribly good on the back nine worsened noticeably on the front. The problems included: spotty greens with sparse turf, chipping areas around the greens that were scalped or muddy, brown grass in the fairways and rough (despite recent rains), and ruts all over that were deep enough to rattle the fillings out of your head when driving over them. The par-4 fifth contains vivid examples of all of the conditioning problems within its 383 yards. After a memorable tee shot that requires a much longer shot than you think to clear the towering trees and deep fairway bunkers at the corner, things go to seed. The fairway is splattered with muddy spots and squishy troughs, and the run-up ramp to the green was pure muck. I need to stress that the problems lie not in the design. Several of the holes are truly memorable: The bowl-shaped green of No. 2 is lovely, and the tiny, amorphous green of the reachable par-5 fifth might yield an eagle putt if you can stick it. Bunkers and mounds fronting some of the greens create clever illusions of shorter or longer than expected approaches (very effective, considering the paucity of yardage markers). Unfortunately, the conditioning is something you'd rather forget. And even though I'd like to blame the bad weather, I don't think it was totally at fault. Before I headed to Calderone Farms, I spoke with my landlord, who had recently played the course himself. So I asked his impressions. "There are some nice holes there," he shrugged, "but I wouldn't make it a point to go back. Some of the greens were in bad shape." Calderone Farms is still young, having just opened on June 23, 2001. So the immaturity of the turf can be forgiven. And if golf booms again in Michigan, the property is perfectly located to draw in Detroit-Chicago traffic, and is poised for growth. However, if the tender new track is not nurtured more carefully, it could sustain damage that won't be so easily repaired. And if relations with today's golfers aren't nurtured, they won't be around to warrant expansion. Well I played Calderone Farms on Sunday and I was left not really impressed with the place. I'm not a fan of hilly courses and it was very hilly on both nines. Also nothing has changed since the initial course review from 10 years ago, there is still inadequate yardage signs, getting from the 4th to the 5th hole was confusing as there is no sign to tell you what the actual hole number is when you get to the tee box. The fairways were full of crab grass and not very well taken care of. Overall I'm glad that I played it just so I can say that I did it but I will most likely not be going back as there are other more playable courses for me in the area. Well I'm heading out to play this course and I always hear great things about it so I guess they worked out the kinks that were there since this article was first published. I'm looking forward to playing hopefully it will live up to they hype! I was told toward the end of the 2004 season that Calderone Farms has new owners and that they planned to lower the rates. That was great news because, even though the rates were not terribly high, it will make the hour's drive even more well worth it, (and with gas prices at record highs maybe the overall cost will be the same or better than it was last year). I really love this course. It is by far the best new course I've played in Southeast Michigan. The track consists of a wide variety of holes, from difficult to relatively easy and including some which appear easier than they are and others which appear tough but turn out not to be so bad. Number 3 for example, is a quite short par four which curves to the left, but the fairway is narrow and if you miss it and the large waste bunker on the right, you'll be lucky to find your ball and even luckier to eke out a par. I cannot reccommend this course strongly enough and I am dying to get out there!